At least one $1,000 scholarship will be awarded to a graduating senior in Clatsop County. Depending on the available balance in the scholarship fund, additional scholarships may be awarded. The winner of the scholarship will be announced at their high school awards ceremony as well as Friday, June 21, at the 2019 festival coronation ceremony. 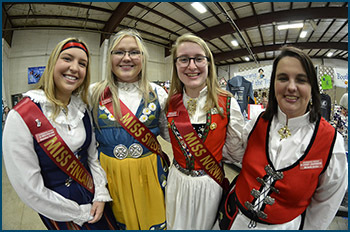 The Astoria Midsummer Festival Association is proud to offer this scholarship in an effort to support the youth of Clatsop County; more specifically the youth that keep our strong Scandinavian heritage alive. The Scandinavian Festival itself is an annual event which began in 1968. Applications must be postmarked by May 1, 2019. We look forward to learning how the festival has impacted your life! If you have questions regarding this scholarship, please contact me at 503-325-4686 or via email at mickeycereghino@gmail.com . Four scholarships were awarded in 2018 to Megan Schacher and Aleks Matthews of Astoria High School and Kara Dowaliby and Nolan Mathews of Warrenton High School. Has had some involvement with the Astoria Scandinavian Midsummer Festival – either as a participant or attendee. Is a graduating senior at a high school in Clatsop County. The scholarship is to be used for post-secondary higher education at an accredited institution. The recipient must use the scholarship in the next school year and must be in fulltime attendance. High school transcript - please black out social security number and any immunization information. Letter of reference from a community leader, respected friend or mentor.